Can't attend? 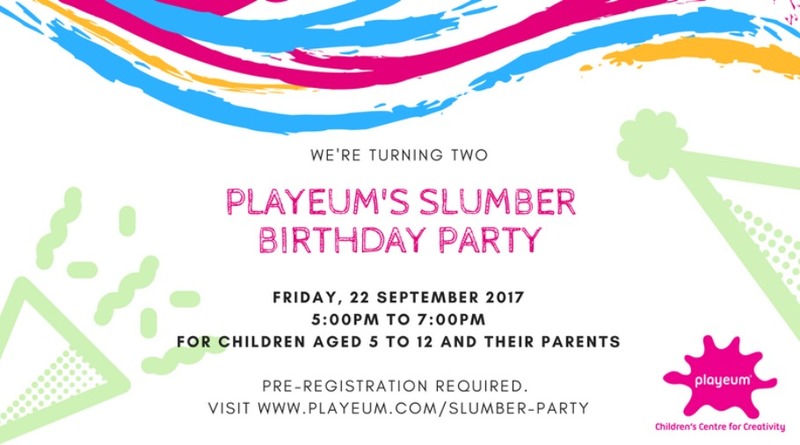 Follow Playeum's Children's Centre for Creativity to know of future events! Join us at our 2nd birthday party! Come celebrate with us as we turn two on Friday, 22 September 2017 from 5pm to 7pm. We’re throwing a Slumber Party that includes Taiko drumming by Mangrove Learning, craft making and an immersive storytelling session under a giant tepee by storyteller Rosemarie Somaiah. No slumber party is complete without any snacks and we’ll have fruit kebab sticks, hot chocolate and marshmellows for playtime snacks! This time round, we’re playing it forward all at the same time where proceeds from ticket sales will go to our on-going fundraising efforts to provide all children with access to play and create. Who said partying and giving back can’t happen at the same time?! So come join us in your jammies – it’s going to be a fun evening and we hope to see you there!